'Smiling Window' mural and other artworks. The architectural design of the entire house was by Sorcar. Manick Sorcar added another unique art piece of his to the Family Room. 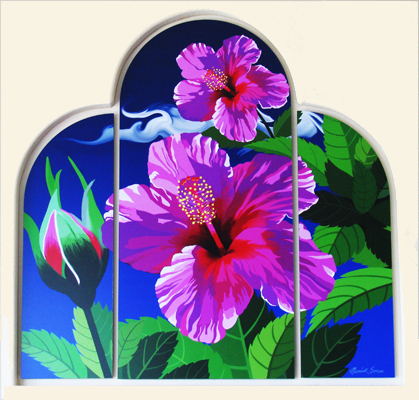 The 6ft x 6ft mural of Hibiscus flowers in three parts was custom designed to fit the unusual wall-niche that followed the contour of the large arched windows in the same room. It was painted in very high resolution on a computer, using electronic brushes and colors. The artwork is named the "Smiling Window". 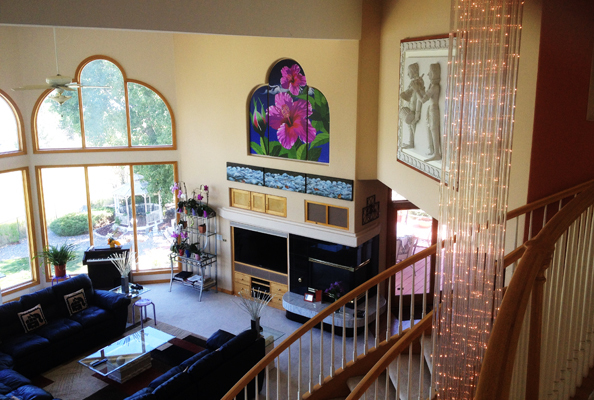 The Family Room contains several other artistic creations of Manick Sorcar in multi-media that includes a life size Styrofoam sculpture of the "Street Musicians", a 12ft wide "A Touch of Fall Season" artwork in three pieces, and the 18ft long Chandelier going through the round staircase. Designed by Sorcar, the 7,800 sq. ft. house with large arched windows and a touch of Mughal Architecture was of great interest to The Rocky Mountain News, Colorado's oldest newspaper, which ran a feature story on the residence with two-page color pictures in their Home Front Section. The article "Lakeshore Home is Shrine to Indian Culture" was written by the News Stuff Writer Betsy Lehndroff, and it was published on August 18, 2001, in the weekend combined issue of The Rocky Mountain News and The Denver Post. The news immediately caught the attention of the Asian Art Association of the Denver Art Museum. On September 25, 2001, about two dozen or so patron members headed by Elizabeth Shwayder, the president of AAA, and Ronald Y. Otsuka, curator of Asian Arts, visited the residence in the evening and spent over two hours admiring all of Sorcar's artwork. They were greeted by Manick, his wife Shikha, and their daughters Piya and Payal. 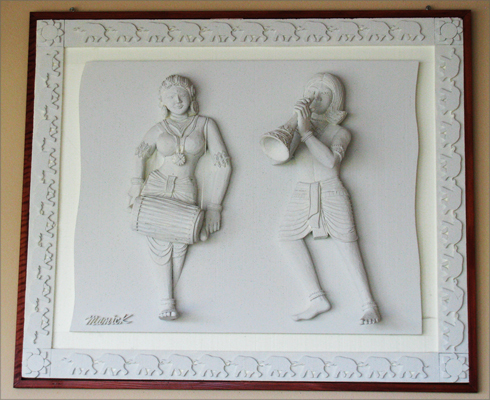 A life-size sculpture of "The Street Musicians" by Manick Sorcar. took almost a month to complete.